Covering a bowling ball with glass can create a gazing-ball substitute for garden art. 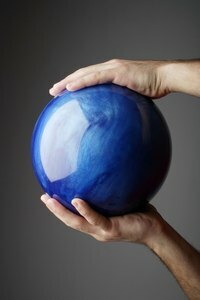 Most types of glass can be used to cover an old bowling ball that might otherwise be bound for the dumpster. Pieces of stained glass or pre-cut glass tiles glued to the ball create unique mosaic patterns. Other types of glass, such as glass nuggets, sea glass, ornamental jewels or even marbles can add design possibilities. Mix a small amount of sanded grout with grout additive to the consistency of peanut butter. Wearing rubber gloves, plug the finger holes with grout and let dry overnight. Or, if displaying in the garden, leave one hole open to mount the finished ball on a rebar post. Clean the bowling ball thoroughly and use sandpaper to rough up the surface. This helps the adhesive bond better to the smooth bowling ball. Place the ball in a large metal bowl so it doesn’t roll around. Working on only one half of the ball at a time ensures that the pattern isn’t disturbed by movement. Butter the first piece of glass with a mosaic adhesive and firmly press it on the ball. Continue buttering each piece of glass and adding to the ball in the desired pattern. Allow the adhesive to dry before turning the ball over to the other side. Drying normally takes about 24 hours. Complete the glass- mosaic pattern on the second half of the ball and allow to dry. Mix enough grout to cover the ball. (There's no precise measurements for this because of shape and joint width between the glass pieces, so mix up additional grout if needed. )Wear rubber gloves and spread the grout over the ball, pushing the grout into the crevices between the glass pieces. Allow the grout to set up for about 10 or 15 minutes, then remove the excess grout with a damp sponge. Be careful not to pull out any of the wet grout. Use a soft cloth or paper towel to buff off the haze left by the grout. Allow the ball to dry for at least 48 hours. Apply the grout sealer with a paintbrush and allow to dry before placing it outside. Make sure to use an adhesive that is compatible with glass and is waterproof if used outside. Purchase bags of broken stained glass pieces from a stained glass retailer or you can make your own by placing a large piece of glass in a paper bag and busting it into small pieces with a hammer. Wear safety glasses whenever working with glass. Wear rubber gloves to protect your hands when working with the grout.